Cap up to 20 cm, at first hemispherical, then convex to flat-convex, almost white, silvery grey, grey to greyish ochraceous or ochraceous, sometimes developing olivaceous tint with, dry, smooth or sometimes finely cracked, not blueing when bruised. 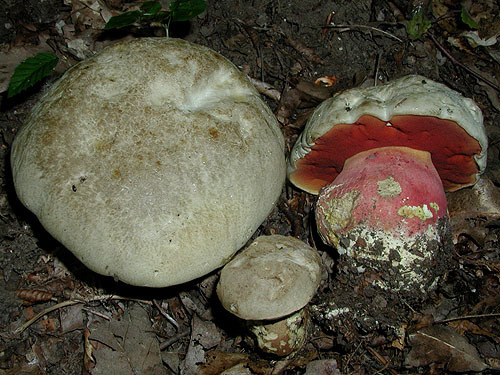 Stipe clavate, usually strongly bulbously swollen at the base; cream, lemon yellow to bright yellow in the upper part, downwards gradually becoming carmine or pinkish red, at least in the upper part with well developed fine, concolorous with the background or red network, blueing when bruised. Tubes at first lemon yellow, then yellow with somewhat olivaceous tint, blueing when damaged. 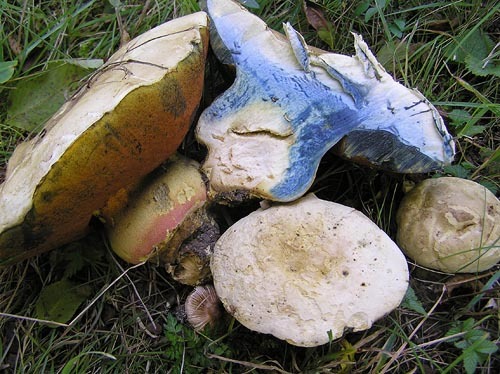 Pores bright red to orange red, gradually becoming paler towards the cap margin, blueing when bruised. 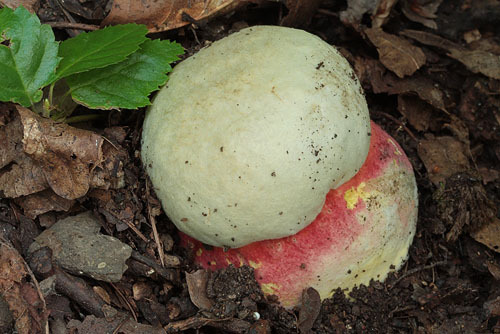 Flesh pale lemon yellow in young fruitbodies, later whitish or white in the cap and the stipe, under the cap cuticle often with pink line, blueing when exposed to air. Smell not distinctive, but unpleasant in old fuitbodies. Taste slightly acid. Spores 9.5–16 × 4.5–7.5 μm, ratio 1.8–2.7. Pileipellis (the cap cuticle) trichodermium of interwoven septate hyphae of cylindrical, finely incrusted cells. Chemical reactions: hyphae of the flesh in the stipe base inamyloid with Melzer’s solution. Habitat. Warm broadleaf forests on calcareous soils, mycorrhizal with oaks (Quercus), beech (Fagus), sweet chestnut (Castanea), hornbeam (Carpinus) or lime (Tilia). Distribution. In Europe widespread but mostly seldom; much more common in south, in northern areas very rare, absent in the far north. Similarity. 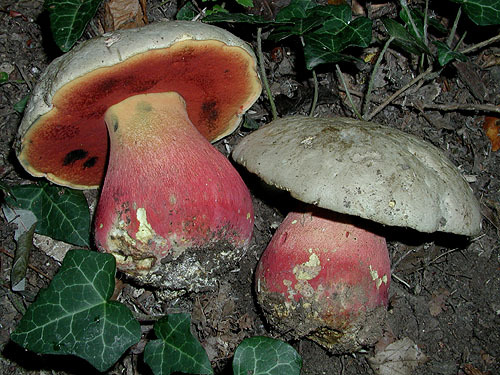 Similar and sometimes probably confused with Boletus rhodoxanthus, Boletus legaliae and B. rubrosanguineus. 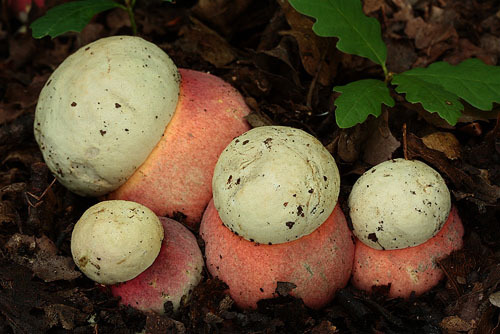 The two latter however develop pinkish to vinaceous tints on the cap that are usually not seen in B. satanas. In addition B. rubrosanguineus grows mostly in coniferous forests in mountain areas, where B. satanas is not seen. 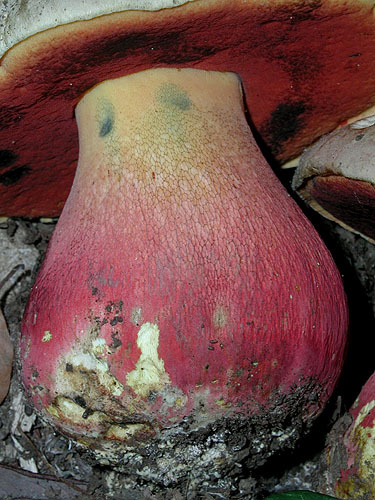 Boletus rhodoxanthus is distinguished on account of the pinkish tinted pileus and the flesh that is yellow and blues in the cap. B. satanas has mostly whitish flesh, blueing both in the cap and the stipe. 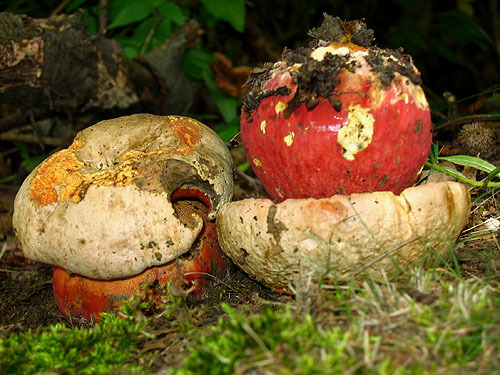 Compare also with Boletus pulchrotinctus.